When Globacom, the Nigerian telecommunications giant, unveiled Anthony Joshua as its brand ambassador a couple of weeks ago, something delighted me. Even though I know that the world heavyweight boxing champion is originally from Nigeria, I always see him as British. After all, Joshua -- who currently holds three of the four biggest world titles -- flies the British flag. He represented Great Britain at the 2012 Olympics and won the superheavyweight gold medal. I had some good feeling watching him in the Glo TV commercial talk about "we Nigerians" and our resilience. He may be flying the Union Jack but he is still very much in touch with his roots. Joshua once proudly told the world about his love for pounded yam, eba and egusi soup. Dr. Mike Adenuga Jnr., Globacom chairman, threw a really good marketing punch by bringing the six-foot-six boxer home to "fly" the green-white-green flag. Even though Joshua's rendition of "Glo, I hail o!" does not sound pidgin enough, I will manage that for now. Reggae legend Winston Hubert McIntosh aka Peter Tosh sang: "Don't care where you come from/As long as you're a black man, you're an African/No mind your nationality/You have got the identity of an African." Fly the British flag, hold the British passport, speak the British accent -- the Nigerian blood still runs in your veins. Many have chosen to deny their Nigerian roots -- maybe out of anger, disappointment, arrogance or shame -- but, as the saying goes in Urhoboland, "Talk am go, talk am come, Saduwa na Bini man". (Saduwa is the Urhobo corruption of the Bini name, Osasuwa). I do not begrudge those who are ashamed to be associated with their Nigerian roots. We are not pulling our weight. The news coming out of Nigeria is often laced with embarrassing content. As we troop to the polling units on Saturday to elect the president that will pilot the affairs of the country for the next four years, the views from abroad are shaped by the pessimism that there will be rigging and violence. It is a shame. There is this impression that Nigerians cannot pilot their own affairs decently. Many observers naturally expect ballot-snatching, voter suppression, underage voting, shooting, killing and outright falsification of results. It's tough to be proud of Nigeria or to be proudly Nigerian under these circumstances, except you are dyed in the wool. But be of good cheer: we have done it before; we can do it again. Four years ago, we defied the scary predictions. Doomsday experts had said the CIA had predicted that Nigeria would break into pieces in 2015, and the elections were to be the trigger by their own calculations. Four years on and we are still breathing. Meanwhile, conventional wisdom had it that no incumbent Nigerian president would ever be defeated; even if he lost, he was expected to change the figures and sit tight. Well, we shamed the cynics. President Goodluck Jonathan not only lost, he picked his phone and congratulated his opponent, President Muhammadu Buhari, while final result was yet to be announced. It was not as if he did not have enough grounds to complain, cause trouble or head to the courts, but his heart ruled over his head and he did the needful. It happened here in Nigeria. When we are written off, we are capable of showing the world that something decent can still come out of this land. While we need all the peace we can get, we cannot be talking about peace without justice. Electoral violence may be senseless, but a feeling of injustice pushes people to the streets. Elections must not only be free and fair, they must be seen to be free and fair. People must learn to defend their votes in an orderly manner. Those who foment trouble out of desperation must be contained as a matter of duty by the security agencies. We have shed too much blood and ruined too many lives at election times in this country. It doesn't make sense. Jonathan's words -- "my ambition is not worth the blood of any Nigerian" -- should be the mantra for our politicians. The Independent National Electoral Commission (INEC), theoretically the key institution in the elections, must be evidently neutral. I have confidence in the ability of Prof. Mahmood Yakubu, the INEC chairman, to organise credible elections. But it is not all about him. The resident electoral commissioners, called RECs, have the capacity to wreck the elections. Yakubu will be in Abuja on election day. He cannot account for what the RECs will do in the 37 jurisdictions across Nigeria. But he can do something: he can let it be clear to them that those found wanting would face the law. Luckily, the courts are now jailing INEC officials. That should ram some sense into their heads. The security agencies, in practice, play the key role in determining election outcomes in Nigeria. If they do their job very well -- meaning they are non-aligned and they treat every voter equally while keeping the peace -- all of us would be the better for it. In the past, security agencies were used to suppress voter turn-out in order to give undue advantage to some candidates. I recall that several years ago, soldiers deployed in a particular state on the eve of an election shot into the air and sang war songs all through the night. The people were so intimidated they did not bother to come out of their homes to vote. That is how voter suppression works. Security agents also participated actively in ballot-stuffing. They provided cover for the alteration of figures. In other instances, they arrested and detained influential political figures on the eve of elections in order to demoralise their supporters and give their opponents the upper hand. Vote-buying is another instrument of rigging. These are disgraceful things that damage Nigeria home and abroad. It is believed by many analysts that if the security agencies were to discharge their duties professionally, these issues would be well taken care of. That is how important they are. They can mess up the elections if they decide to be unethical. If INEC conducts itself creditably well and the security agencies perform their duties professionally, we would be showing to the world again that we can do things decently. Contrary to whatever some might be saying, it is not in the interest of anyone that the country should catch fire. No, we don't need body bags. Nobody's ambition is worth the blood of any Nigerian. Not in a million years. There is a Yoruba proverb that says "irorun igi ni irorun eye". If the tree is not conducive enough, the bird cannot perch comfortably on it. No matter the candidate we support, it is the peace and progress of Nigeria that should ultimately matter to anyone who genuinely loves this country. 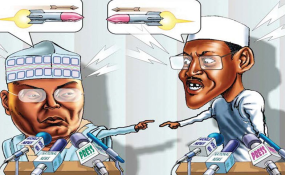 Saturday's presidential election is essentially a straightforward heavyweight bout between President Muhammadu Buhari (APC) and Alhaji Atiku Abubakar (PDP). Buhari is the defending champion. Atiku wants his belt. It is going to be a "thrilla and a chilla". We must also make honourable mention of the "third force" candidates -- the cerebral Prof. Kingsley Moghalu (YPP), whom Prof. Wole Soyinka has endorsed, and Omoyele Sowore (ACC), citizen journalist with disruptive ideas. Fela Durotoye (ANN), Gbenga Hashim-Olawepo (PT) and Tope Fasua (ANRP) are also on the list of the record number of 73 candidates. But it is clearly a two-horse race. That's a no-brainer. Finally, our politicians must watch their words and call their supporters to order. I am particularly concerned about the two leading candidates -- Buhari and Atiku. Their supporters should take the results in their strides rather than incite violence. By now, we should have gone beyond the typical Nigerian politician's mentality of "if I don't have it, then nobody else should". They should be ready to concede. Jonathan has showed us the way. We should be moving forward not going backward. If any candidate feels strongly that he has been cheated, there is the option of litigation. At this age and time, we must look at the bigger picture of Nigeria's progress. That matters a great deal. Above all, the most important "candidate" that should be the "winner" is not even on the ballot: the Nigerian. We have been bruised and battered for ages. We have been squeezed, sucked and dumped like orange. We ought to have given up on this country long ago. But as Anthony Joshua says in the Glo commercial, "We don't stay down. We get up and fight." That is resilience. We fall down, we get up. We renew our hope that Nigeria shall be great someday. We deserve a peaceful and progressive country that anyone with Nigerian blood can proudly show off. That should be our drive, no matter who wins. Nigeria is bigger than Buhari and Atiku combined. Let that sink in. President Muhammadu Buhari holds the appearance record in Nigeria's presidential elections, having been a candidate in 2003, 2007, 2011, 2015 and now 2019. His cumulative 44.3 million votes in the past four polls are also the highest, averaging 11 million per contest. He has won once. Next to him is Pastor Chris Okotie, who ran thrice (2003, 2007 and 2011) and scored 228,000 votes in all. The 2003 election was the first in which a "couple" contested. President Olusegun Obasanjo (PDP) was challenged by his ex-wife, Major Moji Obasanjo (Masses Movement of Nigeria, MMN). She was the first female presidential candidate, by the way. She died in 2009 at 65. Pioneers. All the candidates that contested in the 1979 elections have died --Shehu Shagari (NPN), Obafemi Awolowo (UPN), Nnamdi Azikiwe (NPP), Aminu Kano (PRP) and Waziri Ibrahim (GNPP). Kano was the first to die (1983), Shagari the last (2018). Also, all the candidates that contested in 1983 are no longer with us: Shagari, Awolowo, Zik, Ibrahim, Tunji Braithwaite (NAP) and Khalifa Hassan Yusuf, who flew PRP's flag after Kano's death four months to the election. Six of the 20 contestants in 2003 have also joined their ancestors: Dim Chukwuemeka Ojukwu (APGA), Gani Fawehinmi (NCP), MD Yusufu (MDJ), Pere Ajunwa (LDPN), Moji Obasanjo and Braithwaite. Exits. Nigeria has held eight presidential elections in all, three of them in April. In 2003, it was on April 19 (we called it 4/19 polls because of the massive rigging). It was held on April 14 in 2007 and April 16 in 2011. Those of 1979 and 1983 were held on August 11 and 6 respectively. The 1993 election was held on June 12. It was on February 27 in 1999. The 2015 poll could have been on February 14 -- there was no love lost between the government and the opposition when it was moved by six weeks. We now seem to have permanently opted for February. Why? I don't know, but Catholic bishops once complained that the April dates often clash with events lined up for Easter. Settled. Many people have been asking me: "Simon, who will win the presidential election?" I don't know why anybody thinks I have the answer. I am neither a fortune teller nor a pollster. Nevertheless, after coming under so much pressure -- and determined not to disappoint my friends -- I decided to consult my oracle. It did not disappoint me. It told me plainly that the winner of the February 16 poll is a northern Fulani Muslim. The oracle further told me, in unmistakeable terms, that the colours of the winning party include green and red -- with a hand-held personal item as the party symbol. Finally, the oracle told me the winner is his 70s. Bull's-eye.